Bespoke manufacturing joiners TJ Ross is seeking the professional guidance of the Scottish Manufacturing Advisory Service (SMAS) as it aims to increase efficiencies in its business. Last August, TJ Ross moved to new facilities in Glenrothes, which have been bolstered with new machinery, with more to be added in the coming months. A new work profile to improve the procedural flow of the workforce has also been introduced, with help from SMAS. TJ Ross is embracing the opportunities that are arising from the evaluation of its current working practices. 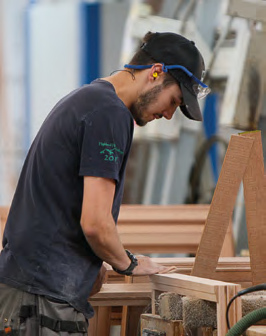 It’s still early days, but already SMAS has brought about small, minor changes, which in turn have resulted in marginal gains for the joinery business, which employs 18 members of staff. Alyn Richardson, Production Director of TJ Ross, said: “This is a journey of continuous improvement, which we expect will bring about significant efficiencies including time savings, improved productivity, as well as the development of our staff, all of which will combine to make us more competitive. TJ Ross has just completed a massive contract, which was exported to the Caribbean in early March.